Having started his career as a comedian and television presenter in the 1970s, Takeshi Kitano has always been more than the writer-director and actor of his own films. Already established as a multimedia superstar (working as a TV personality and actor) in Japan under the name ‘Beat’ Takeshi, Kitano earned himself an international cult following with yakuza gangster movies such as his feature debut Violent Cop (1989), Sonatine (1993) and Hana-Bi (1997). But the recent series of what Kitano has self-deprecatingly called his ‘auto-destruct’ cinema, including Takeshis’ (2005) and Achilles and the Tortoise (2008), has disconcerted distributors and damaged his standing, leading to increasingly limited or straight-to-DVD releases for his films outside of Japan in recent years. 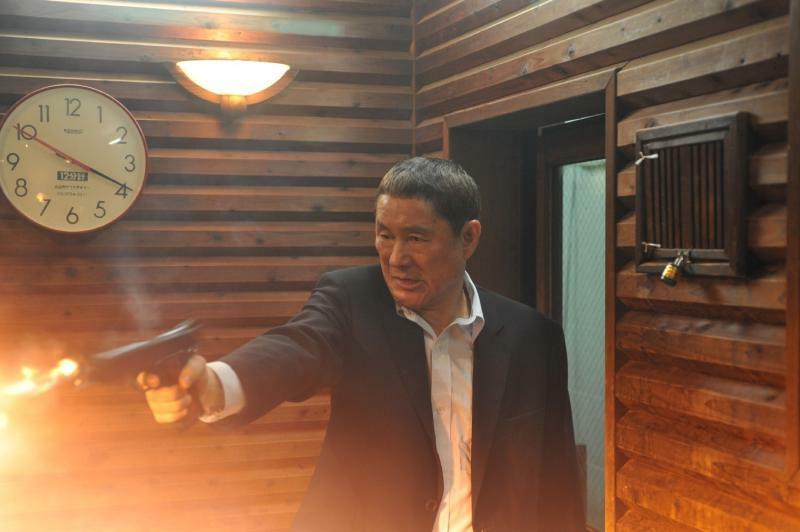 Yet, his latest offering, Outrage, which premiered in Competition at the 2010 Cannes Film Festival, sees Kitano back with a vengeance both behind and in front of the camera, in what feels like one of his most refreshing and enjoyable yakuza thrillers to date. Pamela Jahn took part in a round table interview at the 2010 Cannes Film Festival in which Kitano talked about tackling genre conventions, dentist horror scenarios and what it feels like to be the boss of it all. Q: Outrage marks your return to the crime genre but there is clearly a shift in tone compared to your early yakuza films such as Violent Cop and Sonatine. Although the film is equally violent, the characters are not as cold and cool as they used to be and and you seem to have fun playing with the genre conventions. Was it a conscious decision you made when you started the project to test new grounds with this film? Takeshi Kitano: Of course it would have been much easier to focus on the main protagonist played by myself and make a straightforward yakuza genre movie with lots of violence rather than trying a different route. But when I started working on the film I noticed that many people were very interested to find out what I was going to do next and I thought that if I simply repeated what I have already done in the past people would say, ‘Well, he’s just doing the same old stuff again’. So, yes, I consciously tried to do something different with this film. First of all, I intentionally changed the pace and the rhythm of the whole film and incorporated a lot of dialogue, which I hadn’t really done before in my earlier movies. I also stepped back from the limelight as the main character. I mean, although I am the main character, the film is not just about this one protagonist. It’s more about the whole group of gangsters, so it becomes an ensemble film. Most importantly, however, it has this kind of detachment, it’s like watching one of those nature documentaries shows where you see the bugs in the woods killing each other, or ants chasing worms – I kind of treated the characters in the film in that way. So, the emotional aspect is much less important here. Did all this evolve quite naturally or did you work on the script for a long time? I worked on the script for this movie backwards in that the very first scene, the very first idea that I had, was the sequence when one of the yakuza characters gets beheaded with the string attached to his neck and gets dragged away by a car. And from that point on I went backwards in terms of developing the story line. I started thinking of the many ways of killing people, and it was only then that I came up with how the whole trouble begins and what would be the cause of the warfare. But after the first draft I noticed that there were too few scenes featuring myself to make this movie work, so I had to add some more scenes with myself in them because otherwise I would have had too many scenes with different characters and the story wouldn’t have worked as a whole. How did you come up with the idea of the man getting beheaded by the car? It is the development of an idea that I ended up not using for my previous movie Achilles and the Tortoise, where I thought that the protagonist that I played in that movie would hang himself. He would attach a string to a tree and put the rope around his neck and then the car beneath him would slowly move forward. But then the woman would drop from the tree and he would fail to kill himself. But I dropped that idea after discussing it with my crew, who said it would look too much like a comedy and that it wouldn’t fit with the rest of the story. The scene in Outrage is almost a revised version of that. While I was writing this script and while I was shooting, my intention was that all the violence should look as painful as possible because that’s how it is in real life. Violence is a painful thing. But then I felt that it was actually very difficult to find a balance in portraying the violence because if you bring a chainsaw into a yakuza movie it suddenly turns into a horror movie. So you can’t get too carried away with how people get killed in a gangster movie. But one of the ideas I came up with was the dentist scene, which is inspired by me having treatment at a dentist in the past. What happened was that while I was receiving treatment, my dentist’s phone rang and she said, ‘Mr Kitano, I have to take this call, do you mind waiting for a moment?’ I said ‘OK’ and she went out of the room. And then I had this weird idea thinking, ‘Oh my God, what if somebody broke into the room right now and started drilling my teeth, that would be a nightmare’. And suddenly it hit me, that this could be a great scene in the film and as soon as I got out of that chair I wrote it down. Then there is this tongue scene, I thought that worked really well in terms of trying to combine the violence and the humour, especially because I noticed the reactions of the audience at the official screening. I didn’t have the intention to make those violent scenes comical at all, but I noticed during the editing that many of the scenes are almost hilarious unintentionally. But although it wasn’t my intention in the first place, it eventually turned out to be a good thing because it somehow works as a relief for the tension. Outrage is very much a film about men in conflict about their egos, their self-serving aspirations and ambitions. In real life, being the boss of your own production company Office Kitano, do you often come across these sort of ego problems with other people, or do people in general get a bit nervous around you? I don’t think people are usually nervous around me because there is never any conflict on set. I have never screamed at anybody on set, in fact, I am a very quiet director, I think. I try to be as cooperative as possible with my crew, and I am open to listening to their ideas. So I’d like to think that my producers and crew members just like to help me too. They might even think I cannot do anything without them and that they have to help me, so actually they might be my nurses rather than being nervous. From your film’s perspective, do you think much of the influence and tactics of the yakuza have changed over the years since you made Violent Cop? Do you have, or used to have, close contacts to members of yakuza gangs? I don’t think this film is a very reality-orientated kind of yakuza movie. Although it is not entirely fictional it is not intended to be realistic either, simply because the conflict and warfare scenes in Outrage are slightly exaggerated. Those things are not really happening in the Japanese gang wars and the violence is not as explicit as in the film. But in terms of yakuza businesses, how they work and how they make a profit, this is an open secret for any Japanese, you don’t have to do much research to know how they operate. Japan is one of the very few countries where the gangsters don’t hesitate to show that they are gangsters, they even put a billboard up on their building saying ‘so and so family office’. You don’t see this in Western countries, right? Aside from dealing with the same subject matter, is there a common thread that runs through your yakuza films? I haven’t given it much thought to whether there is some sort of common thread that runs through my films or my career, because as an actor it is important to try to achieve what you are required to achieve in a project rather than to think about the consistency of a series of similar or different movies. For instance, even if I work purely as an actor for other directors, I basically try to be as cooperative and faithful to the director’s instructions as possible, not thinking about my own ideas, not thinking about my priorities, I am only listening to the director. And when I work on my own movies, it is really the film that calls for a particular performance and it is important to convey that in each project. So it is really difficult for me to reflect upon my work and find out what is different or what has been added to each movie. Another difference that you haven’t mentioned earlier is that you seem to be using a rougher soundtrack than in previous films? In terms of sound, including the music but also the sound effects and the acoustics of the whole movie, I wanted to bring in some notion of comic book sound effects, this same sort of exaggeration. Like in a manga, where you actually read the sound, like ‘bang’ is written on the picture, and I wanted that kind of effect on the sound.